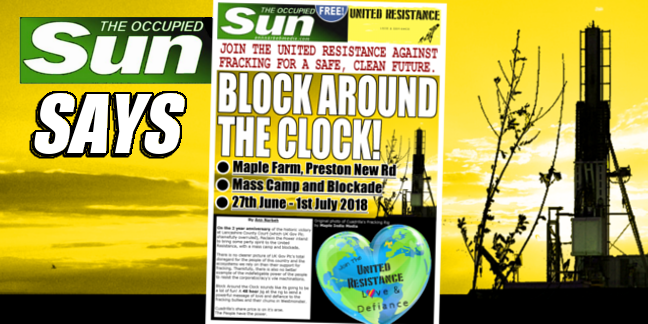 Grab your friends, your dancing shoes and a helping of defiance and **ROCK ON DOWN** to Preston New Road, Lancashire this summer for a peoplepowered, resistance-fueled ‘Block Around the Clock’! For 48 hours we’ll be bringing some extra party spirit to the frontline against fracking. In our hundreds and thousands at the roadside, we’ll be preventing work from happening with our presence and sending a clear message to the frackers they are not welcome - not here, not anywhere. Everyone is welcome, especially if you’ve never been involved in anything like this before. Food provided, friends to be made and a whole programme of trainings, workshops, talks and events to get everyone informed, engaged and skilled up to take on the fossil fuel industry. ‘Block Around the Clock’ is the final showdown of the United Resistance and an epic three months of action, as well as the 2 year anniversary of historic anti-fracking victory at Lancashire County Council - it’s time to get up, get down, and show Cuadrilla what we’re about. Let’s Block. Around. The Clock. 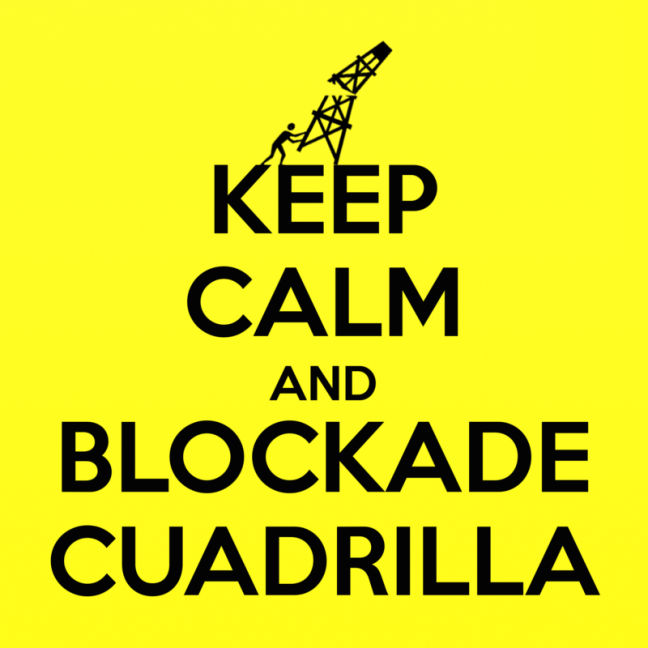 In 2011 Cuadrilla tried and failed to kickstart the fracking industry in Blackpool. Now in 2018, as they finally gear up for the first commercial fracking in the UK, it’s time to remind them what they’re up against. After Cuadrilla’s first attempt to frack at Preese Hill caused earthquake tremors, the government introduced a temporary moratorium on fracking in 2011. But since then, David Cameron’s cabinet announced that it was going “all out for shale” and began introducing planning and legislation sweeteners for the fracking industry whilst slashing support for renewables. Cuadrilla claimed they wanted to turn the Fylde into ‘the biggest gas field in Europe’. Despite that, in June 2015 - exactly three years to the day of Block Around the Clock - Lancashire County Council listened to thousands of objections from the local community and wider public by rejecting Cuadrilla’s fracking application by 9 votes to 4; a clear message to the UK government that fracking wasn’t welcome in Lancashire. Just a year later, in October 2016, the government in Westminster overturned this democratic local decision to block fracking in Lancashire and granted Cuadrilla permission to begin constructing what could be the first commercial scale fracking site in the UK at Preston New Road. Now after years of delays, from frontline resistance and their own incompetence, Cuadrilla finally plans to start test fracking at Preston New Road, Lancashire in “quarter 3” of 2018 for a period of 3 months. If it goes ahead, this frack will be on an unprecedented scale for this country, and the industry are staking themselves on it. As the first commercial fracking site in the UK attempts to go live, the industry’s eyes will be on Lancashire as a litmus test. Since Cuadrilla began building a fracking pad at Preston New Road near Blackpool in January 2017, local people and their supporters have been at the roadside every day disrupting Cuadrilla and targeting the supply chain companies with ‘pop-up’ actions. 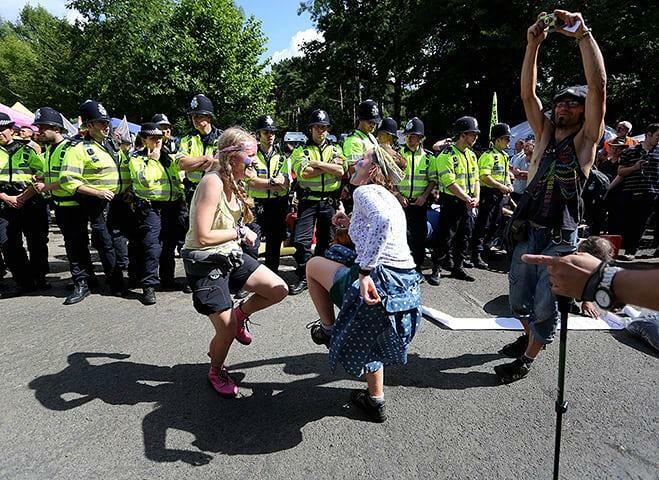 Last July, Reclaim the Power supported the community to shut down the site every working day with lock ons, truck surfing and mass disobedient demonstrations as part of the ‘Rolling Resistance’. Multiple supply chain companies are continuing to pull out and Cuadrilla are months behind schedule. 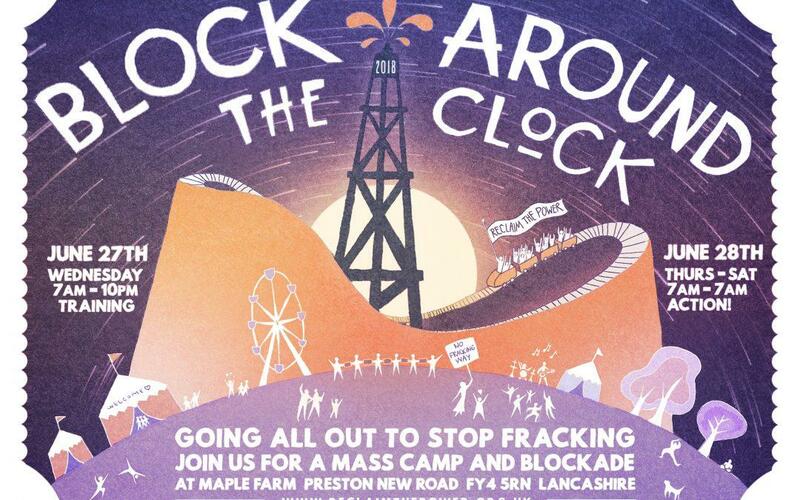 This summer, as Cuadrilla preps for its first frack, Reclaim the Power are back to join the frontline struggle in Lancashire to support the local community’s incredible defiance. We encourage folk to arrive at Maple Farm, Preston New Road, FY4 5RN as early as possible on Wednesday 27th June to allow plenty of time for getting settled into camp life, nourished and participating in the action and legal briefings that will be occurring throughout the day. For those wishing to arrive earlier, camp will be in full swing from Tuesday 26th June serving x3 gorgeously prepared vegan meals per day! If you can’t get up to this beautiful Mass Action Camp for either Tuesday 26th or Wednesday 27th, you are still needed to support the Block around the Clock on Thursday 28th and Friday 29th June - we will certainly be needing reinforcements as the action proceeds. At Maple Farm there will be a Welcome Area and some lovely folk to greet you. There will be tea/coffee available as well access to all site amenities: camping spaces, toilets, workshops and communal eating spaces (more details below). Food will be served 3 times per day. The farm is a 10 minutes walk to the fracking site. Please note, not to pull up any vehicles at the fracking pad site instead please head straight to Maple Farm, even pulling over briefly outside the fracking site is not advised as this causes unnecessary problems blocking traffic for the public living on the area. Please bring a small tent, and if it's big enough share with others. The campsites are large but once many people arrive we need to use the space as best we can. Beware of the ‘Tent Master’ who will be about to guide the placement of your tent. Please bring cash with you to donate to camp if you can afford to, it all adds up and make a difference. £25 suggested for camp and a few pounds for each meal. Though money is not necessary, just get yourself there! There are awesome BnB’s in Blackpool which is only a bus ride away from camp and the fracking site, so if you don’t fancy camping or suffer from sleeping on the ground, please look at that as an option.